QC is the son of a football coach. In the early evening on October 6, 1967, QC's mother picked up the telephone in her apartment and dialed the priory phone number at St. Margaret of Cortona in Cincinnati, Ohio. "Father," she said when the priest answered the phone. "Could you please go out to the practice field and get my husband and tell him he needs to come home. I've gone into labor." The thoughtful, though slightly disrupted, cleric went to the field that was located behind the priory. There he found QC's father preparing the St. Margaret Fighting Irish for their upcoming game that Sunday. QC's father left his assistants with a few instructions for the 7th and 8th-graders and went home to pick up his wife. Less than an hour after arriving at the hospital, QC entered the world. In the early 1970s, a child's first lessons of the paradoxical ideas of competition and teamwork almost always took place on a baseball field. But it was not so for QC who was introduced to the concepts at his father's football practices. Shortly after QC's father took over as coach of the St. Gertrude Bulldogs in 1972, QC became a visitor at practice. QC also took part in the ritual watching of film projected on a hallway wall, acted as a co-conspirator on play design, and tagged along as a scouting and coaching clinic side-kick. QC's father would write the names of his 7th and 8th-graders on 2-inch by 2-inch index cards and he and QC would lay the cards on the kitchen table, move them around into different positions on offense and defense, and determine which player fit in best at each position. It was a wonderful way to grow up. At St. Gertrude, QC's father built a Catholic Youth Organization (CYO) dynasty that won 7 city championships in 9 years between 1974 and 1982. In 1975, St. Gertrude was led by QB Tom Lockwood and linebacker Rick Naylor. The Bulldogs finished 11-0 and defeated arch-rival Immaculate Heart of Mary in the title game, 15-6, at the University of Cincinnati's Nippert Stadium. Four years later, Lockwood and Naylor and three of their St. Gertrude teammates (linebacker Pat Hunt, defensive end Jerry Kyne, and defensive back Andy Fladung) led Archbishop Moeller High School to a 12-0 record, the Ohio Class AAA state championship, and the 1979 national championship. In a 41-7 blow-out of Parma Padua in the state championship game, Lockwood completed 16 of 21 passes for 170 yards and 3 TDs. Naylor was named a Parade Magazine All-American. (Future NFL stars Herschel Walker and Wilber Marshall also made the team.) From Moeller, Naylor went on to Notre Dame where he became a 3-year starter at linebacker for the Fighting Irish. In 1981, QC was an 8th-grader and a starting defensive back on the best Bulldogs' team since the 1975 juggernaut. Led by running back Ray Hilvert, the team finished 11-0. In a 28-14 win over St. James in the CYO city championship game, QC and his teammates on defense ruined the day for opposing quarterback Greg Frey, who eventually would go on to start at quarterback for 3 years for the Ohio State Buckeyes. In 1982, QC entered Moeller just in time to see quaterback John Shaffer guide Moeller to another Ohio state championship and the 1982 national championship. In a 29-15 win over Anaheim Servite, Shaffer and the Crusaders overcame future NFL QB Steve Beuerlein. In a 35-14 win over Massillon in the state championship game, it was future Ohio State All-American Chris Spielman that was vanquished. After the victory, Pete Rose and local news anchor Nick Clooney, father of überhunk actor George Clooney, discussed the Moeller dynasty on Cincinnati television. Five years later, Shaffer would coax just enough offense from his Penn State teammates and linebacker Shane Conlan and his defensive teammates would intecept Heisman Trophy-winner Vinny Testaverde 5 times to stun the favored Miami Hurricanes in the 1987 Fiesta Bowl, 14-10. QC's own 4-year career as a defensive back at Moeller is of zero historical significance. However, it is doubtful that any player ever lined up on a daily basis in practice against a more talented group of wide receivers than QC did while at Moeller. First, there was QC's old grade school teammate, Hilvert (No. 88 in this video), who remains Moeller's all-time leader in career receiving yards and who went on to captain Boston College in 1990. There was 6-foot, 4-inch Vada Murray, who moved to defensive back as a junior and went on to start for 3 years at safety at Michigan. There was Tom Waddle, who turned in a memorable performance for Chicago against Dallas in a 1991 playoff game, made All-Madden, and is an NFL Network analyst. 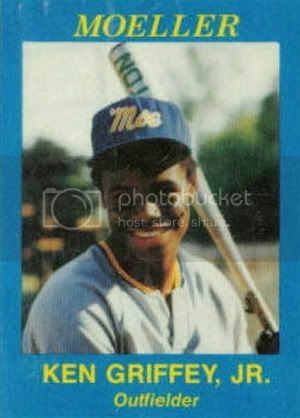 Finally, there was a player that ended up making his mark in baseball, rather than football: Ken Griffey, Jr. Like Bo, QC knows coverage. In the last football game in which QC ever played, coach Steve Klonne, Hilvert and Murray led Moeller to a 35-11 win over the Canton McKinley Bulldogs in the 1985 state championship game at Ohio Stadium. Moeller running back Tony Jackson sparked the victory with a 76-yard touchdown run in the first quarter. Canton McKinley was coached by Thom McDaniels, father of New England Patriots' offensive coordinator Josh McDaniels (then age 10) and Rutgers wide receivers coach Ben McDaniels (then age 4), and led on the field by linebacker, Percy Snow, who would go on to Michigan State and become the only player in college football history to win both the Lombardi Award and the Butkus Award. When QC left the field that day at the Horsehoe in Columbus, he thought that he was leaving football behind forever. And for more than a decade, he did. However, in 1998 QC purchased his first home computer and went looking for something called the internet and a web site that covered Ohio high school football. Surely, he thought, such a site already existed. But it did not. So QC created The Ohio School Football Report and, not knowing what to expect but expecting that whatever it was it would be good because it would involve high school football, set out around Ohio to watch and document high school football in every nook and cranny of the state. Five years later, when the Report closed down for good, QC had visited more than 70 high school stadiums and seen more than 150 teams play. One of the first memorable peformances was turned in by Ben McDaniels of Canton McKinley. In 1997, Josh's little brother had been at quarterback for his father on a Bulldogs' team that captured both the state and national championship and that featured future NFL players Kenny Peterson, Jamar Martin, and Mike Doss. In 1998, with only Doss still around, Ben took the Pups to another title. In the championship game, a 33-10 beat-down of Cincinnati St. Xavier, Ben was masterful completing 15 of 17 passes for 221 yards and 2 TDs. "I think he's the best QB we've gone against," St. X defensive end Dave Bareswilt said. "He really knew what he was doing out there. I guess it has something to do with his dad being a coach. He just picked us apart." Over the years, QC witnessed first-hand many outstanding performances by players currently in the NFL. In Troy, Ohio, a nasty tight end named Kris Dielman (Chargers) pancaked many a Piqua defender to spring running back Ryan Brewer for 287 yards and 3 TDs. In Columbus, a lanky QB named Brady Quinn (Browns) passed for 441 yards to lift Dublin Coffman to a thrilling 42-36 victory over a Findlay team coached by Cliff Hite, the man who played Ben Roethlisberger at wide receiver. (Seriously, Cliff Hite was a tremendous high school football coach who designed high school passing attacks as fine as QC ever saw anywhere. It is pretty funny that Hite is known for putting Roethlisberger at wide receiver, but fortunately Coach Hite has a great sense of humor.) In Cleveland, a mercurial quarterback/defensive back named Troy Smith (Heisman Trophy Winner/Ravens) returned an interception 70 yards for a touchdown for Lakewood St. Edward and a defensive back/wide receiver named Anthony Gonzalez (Colts) of Cleveland St. Ignatius caught a 30-yard touchdown pass. In Dayton, a sophomore running back at Centerville named A.J. Hawk (Packers) ran for 3 TDs in a 35-14 win over Huber Heights Wayne. Oh yeah, also in Cleveland, a huge sophomore wide receiver at Akron St. Vincent-St. Mary named LeBron James caught a 37-yard TD pass in a 34-11 win over Cleveland Villa Angela/St. Joseph. "We knew we had to get the ball to our big playmakers, Tommy McDonald and LeBron James," SVSM coach Jay Brophy told QC as he chatted with James after the game. When you have stood on the field and heard a coach mention Tommy McDonald in the same breath with LeBron James, you know you have heard it all. QC's son, The Boy, is a swimmer (as is his sister, The Girl), and does not play football nor has he ever shown any interst in it. And that's fine. 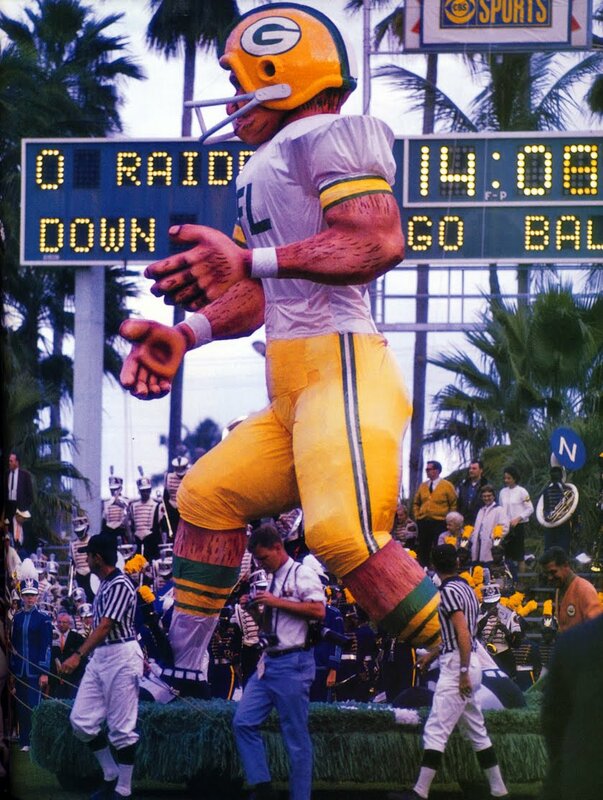 But he won't ever ride in a Packers VW beetle or on a giant Packers float or breakdown film on a hallway wall. And, as a result, in one very small way, his life will never be quite as rich as his father's.